The premise behind the freshly minted AliveShoes label is less of a straight shot than most. After the sneakers are cobbled together, they're delivered in bulk to an artist somewhere on the globe, where they're mobilized as part of a large-scale installation. Once the public sculpture is complete and allowed to linger for a time, the shoes are separated once more for distribution to the footwear-wearing community at large. AliveShoes are more than your everyday ethically produced sneakers. Part organic cotton footwear, part grist for creative calisthenics, each AliveShoe begins life as an element in a one-of-a-kind art installation. 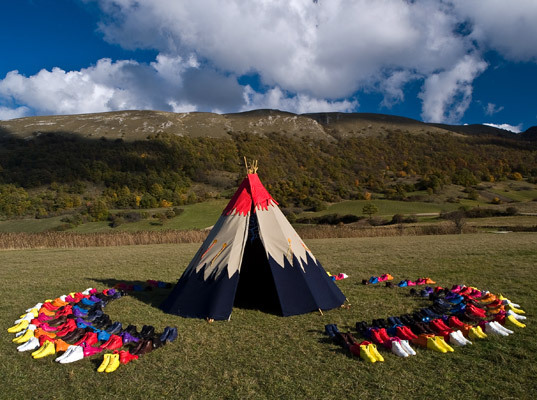 Each AliveShoe begins life as an element in a one-of-a-kind art installation. The earth is to be walked on softly, your shoes express the joy of Spirit Walking with our ancestors, thanks for the gift of your art. Made from natural or organic cotton, leather, cork, and biodegradable thermoplastic polyurethane, each AliveShoe is handmade in Italy's Marche region using traditional craftsmanship. In addition to a unique identification number that corresponds to the art project the shoe originally served in, each sneaker includes a copy of the artist's original sketch stitched into the tongue. "AliveShoes lets people see fashion and art in a whole new way," says Lucca Botticelli, the company's founder. "No longer do people have to link shoes to a fashion brand or designer. Instead, they can derive a personal and emotional value that a piece of art can offer when they wear the shoes." Located in Montelago, Italy, "Pied a Terre" by Argentinean designer Sebastiano Mauri is a Sioux-inspired mandala of color, made from exactly 227 pairs of AliveShoes. We're not going to pretend to understand "Through the Glass," a performance-art piece that charts a "game of relationships and emotions" between two lovers. "The story," Italian artist Francesco Arena explains, "is told passing through the glass and charting the action and inaction of two bodies, of two minds, in a space formed by the footprints of the passage of life." 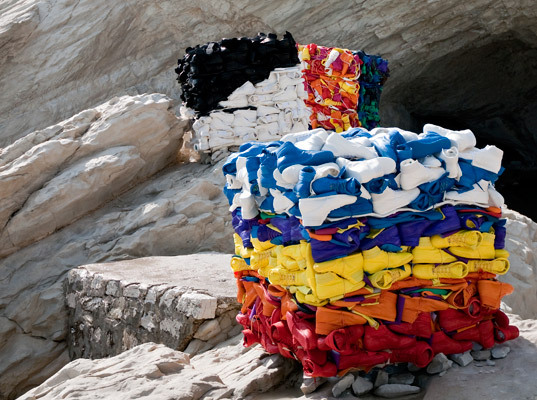 Constructed by New York artist Steven Siegel from 416 pairs of AliveShoes, "Beach Blocks" comprises three compressed cubes of sneakers that held court at a seaside landscape in Sirolo, Italy, for all of a day. Like Siegel's other sculptures of recycled and found objects, these blocks harken to the "new human geology of landfills."